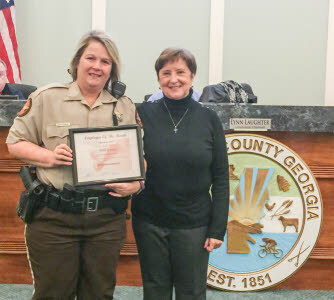 Seventeen years into her career with the Whitfield County Sheriff’s Office, Deputy Beth Gomez is still busy learning. 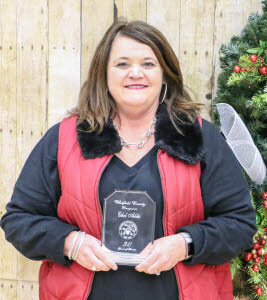 Ms. Gomez was at a training conference on Dec. 6 and couldn’t pick up her award for being named the county’s Employee of the Year for 2017 at the annual Employee Recognition Luncheon, held for the first time at the new Edwards Park Community Center. 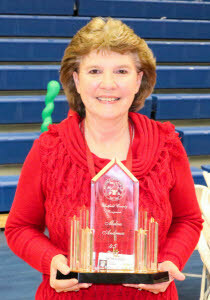 Her husband, Adrian, picked up the award on her behalf. Ms. Gomez began her career with the Sheriff’s Office in February 2000, starting in the Detention Division as a jailer before being promoted to detention sergeant. She has been with the Patrol Division since May 2003 and became a field training officer in 2012, helping train new deputies that are being moved to the Patrol Division. 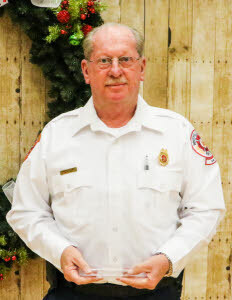 She is the proud mother of two children, one of whom is employed at the Sheriff’s Office, and her husband is also assigned to the Patrol Division. Excitement recently entered her life on Oct. 19 when in a matter of less than five minutes after the crime, she had apprehended a bank robber who had hit the Wells Fargo Bank on Cleveland Highway at Dawnville Road. With the new radio system and computers now in all Sheriff’s Office vehicles, the incident popped up on Deputy Gomez’s screen at 10:44 a.m. She and Deputy Kenneth Henderson both noticed the incident on the screen and called Dispatch to confirm. A lookout was given for a gold Ford Sports Track vehicle traveling down Dawnville Road. Being in the Dawnville area, Ms. Gomez began directing other units accordingly to help in the search for the vehicle. At 10:48 a.m., she spotted the suspect’s vehicle and initiated a stop, holding the suspect until backup units arrived. From the time the initial call popped up on her screen to the time the suspect was pulled over was just 4 minutes, 45 seconds. In fact, Ms. Gomez had the vehicle stopped before the first responding unit arrived on the scene at Wells Fargo Bank. 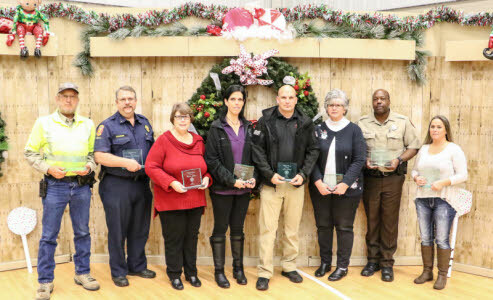 Deputy Gomez wasn’t able to attend the luncheon where she was honored because she was attending a 40-hour class, Sexual Assault Investigations, being held at the Georgia Public Safety Training Center in Forsyth. This training course is designed to support law enforcement officers and investigators in responding to victims of sexually based offenses from a victim-centered perspective. The course provides sexual assault investigators with basic and advanced skills to improve their investigative response to sexually based offenses. Training goals included improvement in on-scene investigative skills and the management of forensic-medical evidence collection practices unique to this victim population. 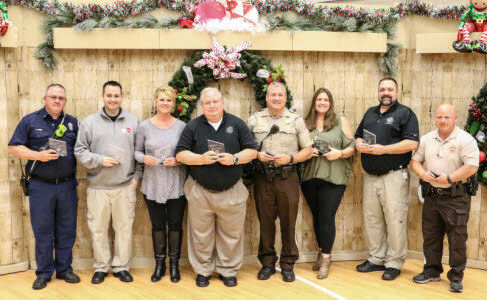 Other nominees for Employee of the Year were Gary Hamrick, Fire, January; Billy Crowe, Sheriff, March; Justin Brown, Sheriff, April; David Metcalf, 911, May; Lori Rowlette, Tax Assessor, June; William Robbins, Sheriff, July; Becky Martin, Public Defender, August; and Ryan Halpin, Sheriff, September. 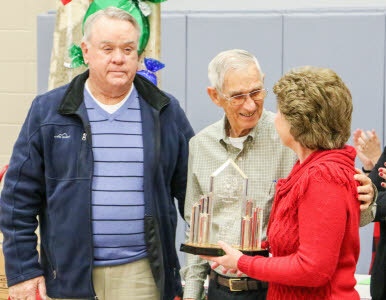 Also honored during the luncheon were 2017 retirees, including Michael Law, Public Works, 12 years of service; Thomas Hall, Magistrate Court, 14 years; Connie Blaylock, Juvenile Court, 20 years; Nancy Chadwick, Sheriff’s Office, 30 years; Don Allen Garrett, Animal Shelter, 25 years; Shirley Hamrick, Board of Elections, 21 years; James Quarles, Sheriff’s Office, 32 years; and Rick Swiney, Sheriff’s Office, 43 years. 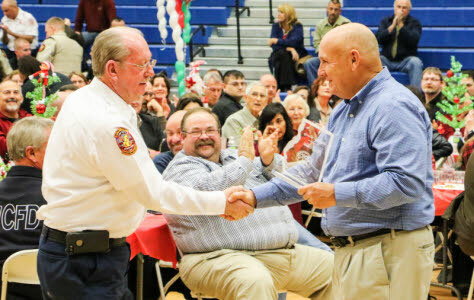 Several employees were recognized with awards for reaching milestone years of service. Alicia Vaughn, Finance; Tifani Keith, Buildings & Grounds; Tyler Mitchell, Donny Jones, Crystal Williams, Jessica Brewer, Zachary James, Jeremy Maddox, and April Martin, Correctional Center; Victoria Keely Parker, District Attorney; William Caylor, Magistrate Court; Amy Phillips, Michael O’Mahony, Tommy Spurlock, Brandon Norwood, Dustin Taylor, and Jordan Williams, Sheriff’s Office; Sarah Young, 911; Melvin Martel, Engineer; Robert Andrew Beavers, Samuel Hammontree, and Kevin Coleman, Fire Department; and Christopher Maness and Robert Souther, Public Works. Brian McBrayer, Finance; Brenda Arnold, Buildings & Grounds; Melica Kendrick, Linda Montieth, and Patricia Smith, Clerk of Superior Court; Angelica Amos and William Robbins, Correctional Center; Susan Beck, District Attorney; Bradley Scott Martin, Magistrate Court; Jacelyn Reap, Ronald Morris, James Boling, James Brown, Bradley Mathis, and Charles Grey, Sheriff’s Office; Jennifer Dean, Superior Court; Paula Headrick, Christopher Blessing, Jonathan Hayes, and Phillip Swably, Tax Assessor; Krista Smith, Tax Commissioner; Tammy Cantrell, Animal Shelter; Edward Kent Benson, Engineer; Jantzen Chance, Jason Phillips, and Nathan Callaway, Fire Department; and Johnny Lawson, Jacob Paige, and Jason Wheat, Public Works. 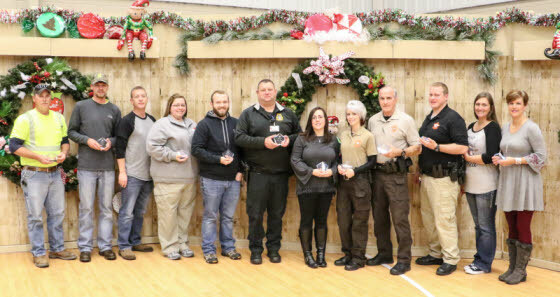 Jeremiah Haynes and Cathy Waters, Correctional Center; Scott Czerneski, Information Technology; Samantha Splawn, Probate Court; Marcy Dyer and Darrell Meadors, Sheriff’s Office; Maxine Cynthia Morris, Superior Court; Stephen Carlock, Tax Assessor; Pamela Sane, Tax Commissioner; David Metcalf, 911; and Ladon West, Fire Department. Jessica Aslinger, Clerk of Superior Court; Nadia Curtis and Andrew Hambrick, Correctional Center; Helen Patricia Bobo and Jason Cooley, Sheriff’s Office; Kristi Queen, Tax Assessor; Pamela Jackson, Tax Commissioner; Rodney Kent Cochran and Shawn Damon, Fire Department; and William Hester, Public Works. 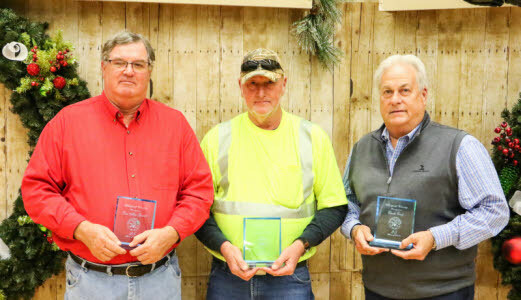 Claude Craig, EMA/911; Ira Maddron, Ronnie Winters, and James Waters, Public Works; and Don Allen Garrett, Animal Shelter. 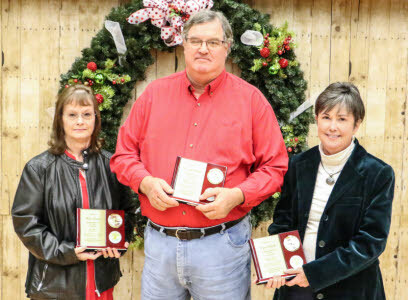 Ethel Addis and Linda Gazaway, Magistrate Court, and Gary Stephens and Nancy Chadwick, Sheriff’s Office. 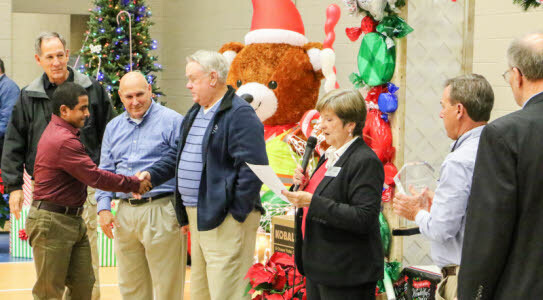 Special thanks to the Recognition Lunch Committee that worked so diligently putting the event together: Jennifer Jones, chairperson, and Shannon Chandler and Missy Williams, all of the Tax Assessor’s Office; Cindy Sherrod, Information Technology; Debbie Roper, Recreation; and Gary Brown and the Buildings & Grounds team.